Stephen King’s The Green Mile is a wonderful read. Set in 1932, it is told in the form of a memoir written by Paul Edgecombe, the former superintendent of Cold Mountain Penitentiary’s E block. “The Block” was the last stop for prisoners destined to sit in the lap of Old Sparky and have a little juice. The floor in the corridor that ran between their cells and the hot-seat was covered in green Linoleum, and so what was known as the Last Mile at other prisons was known as the Green Mile at Cold Mountain. Sixty years have passed and Paul is writing his words from another prison, of sorts—an old people’s home. The story does go back and forth between Cold Mountain and Mr Edgecombe’s present abode, but for the main part it concentrates on 1932. A lot happened that year. Paul had a urinary infection, Percy Wetmore came to work on the block—bringing a bad attitude with him—and a very unusual mouse named Mr Jingles appeared on the block and befriended Eduard Delacroix for a little while before Delacroix’s particularly terrible death in the chair. Then there was Wild Bill Wharton—trouble with a capital T and don’t forget to underline it. Most of all though, 1932 was the year of John Coffey and this is the real story that Paul is trying to get out of his system and down onto paper. When John Coffey arrived on the block the first thing that everyone noticed was his size. He was a big man and, if Wild Bill gets a capital T for trouble, then John Coffey gets a capital B for big: six feet, eight inches tall, and around three hundred and fifty pounds. Coffey is a big man, but he is a quiet man, a gentle man, and he cries a lot. Not at all, in many ways, the kind of man you might expect to walk the mile for the murder of two little girls. But as Paul and the rest of the E Block guards become better acquainted with John they discover that there is an awful lot more to the big, bald headed black man than any of them could ever imagine. The Green Mile is an enjoyable story that is populated by some very believable characters. King’s prose brings them to life and allows the reader get to know them almost as friends, so if they should die at the turn of a page, it is all too easy to grieve their loss. My favourite characters would have to be Paul Edgecombe and John Coffey, with Mr Jingles running a close third and pushing his coloured cotton reel before him. But every good book needs someone for the reader to hate, and the two characters that got my blood boiling were Wild Bill and the hickory stick-wielding Percy Wetmore. 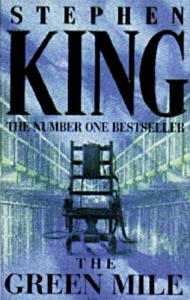 The Green Mile is around 450 pages long, which is not an unusually lengthy work for Mr King. What is unusual though, is the fact that the novel was originally printed in serial form, as a kind of experiment. According to the book’s Forward, Ralph Vicinanza, a long time friend and business associate of Stephen King, got involved in a conversation about Charles Dickens. Many of Dicken’s novels were written in instalments that were either featured in magazines or else were printed as chapbooks. During the course of the conversation someone wondered what might happen if a modern-day writer were to bring out a novel in the serialized form; someone like Stephen King for instance. The rest is history. The Green Mile was originally issued as a series of six chapbooks. After the reader had read one book, they then had to wait for the next installement to be written. This meant that King had to write each one to a strict deadline, and the poor, old readers had no chance of flicking ahead if they got a little curious about what was coming next. That was then. Now anyone can buy The Green Mile as a complete volume and flick ahead to their heart’s content (though I never do). I only noticed one difference caused by the book’s intial serial format: when I began reading a new section, there was usually a paragraph or two that repeated what had happened in the previous instalment. Apart from that, if there were any other differences between The Green Mile and normal novels, I failed to notice. But it is not surprising; I was too interested in finding out what happened next.